It’s been a while since we’ve mentioned this course, of course since we mentioned it back in May 2010 – eLearnSecurity – Online Penetration Testing Training – eLearnSecurity has been making continuous improvements to the course-ware and the subject matter. But now in 2012, it’s time for them to release their major facelift – Penetration Testing Professional Version 2. The crew over at eLearnSecurity has drastically improved the overall course material, and if you are familiar with the first iteration you can see they’ve put a lot of effort into it. There’s a lot of new stuff 4 hours of new up to date videos, 800 new slides and even completely new modules – with a makeover on all material. The first two sections of the course (Network & System Security) have seen the most changes. Whilst the Web Application security section has undergone a content review but has had no new additions in terms of contents. The use and the samples within the course have been updated to match the new features of the most important tools: Metasploit, Maltego, SET, Nmap and others. Many new tools like FOCA, ShodanHQ, ncrack, Immunity Debugger, HPing2 have been added and covered in-depth within the new videos. The slide deck has been completely redone and significant improvements have been made in readability and usability. You will now find immediate access to videos contained in each module and also references for further reading about each topic. Hera Lab is the new virtual lab that our students can access through VPN to practice all the techniques related to system security and network testing. A very detailed and in-depth analysis of Windows authentication protocols such as LM, NTLMv1 and NTLMv2 is provided through videos and real world examples that the student can test against the Hera Lab machines (This is a completely new chapter). A lot of feedback has been gathered from the students and users of the course-ware and those have been implemented in this new version to enable faster, more efficient learning. The Course – Details About The New Stuff! This section included some of the simplest explanations of Exploit development and shell-coding available today, however it has been further improved with more samples, videos and tools that aid in the process of exploitation. 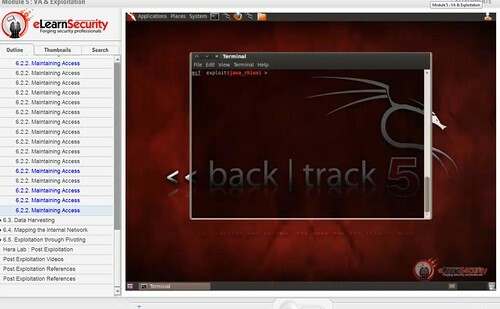 The videos are really clear, move at a good pace and have a very easy to follow voice-over – you can see the video demo running Metasploit on BackTrack 5. More C++ and ASM basics are covered in the Introductory model and this should lower the entrance barrier for someone without these kinds of skills. The contents in this section are a lot better organized now and much easier to understand in practice thanks to a Virtual Machine pre-built with C++ compilers, Assemblers, Debuggers, Disassemblers and all the samples included throughout the section. The Virtual Machine is available within Hera Lab and accessible in VPN/RDP. This drastically minimize the time required to the student to configure the environment. The good part is that the student is also taught how to configure the environment on his own machine for use even after the Lab time expires. 4 out of 8 modules in this section have undergone major changes, the Information Gathering module in v1 had some overlapping information with Information Gathering module in Web Application security so it really required a re-work. The Information Gathering module has been completely redone from scratch and has been created systematically along side a methodology which will allow you to thoroughly investigate a target organization from a business and technical perspective. At the end of the module students can practice all the business related investigation techniques against a fictitious company created by eLearnSecurity with an actual web presence and documents available online. This real world exercise and the Information Gathering lab included in Hera Lab, makes this module a very hands on module. The Port Scanning module now includes techniques to evade IDS’s and Firewalls as well as an in depth study of the Idle Scan technique that most of the times goes unused even by experienced pentesters. The author decided to use HPing2 to first demonstrate the technique at low level and then Nmap. The exploitation module also contains a thorough review of the Java Rhino client side exploit with two videos on how to use it against Windows and Linux by modifying SET and mount a fairly complex attack. But the part that shines the most in v2 of this training course is the Post Exploitation module that provides a clear cyclic process in 4 steps to escalate privileges, maintain access, harvest internal documents or credentials and exploit and infiltrate further internal networks through pivoting. The depth of the information in section and the logical flow with which it has been assembled shows the stark difference between free stuff you can find online and a course you need to pay for. It’s a great update to an already very strong course, I honestly can’t wait to see where they take it next. I want to clear some time to check out Hera Lab properly and get a hands on feel of what they are doing with that. Remember if you are looking for something more basic/entry level – there is also the Penetration Testing – Student Course/Training by eLearnSecurity. eLearnSecurity crew has confirmed to me that they are going to add new labs and scenarios every month to cover new parts of the training material and new tools that will be released in the future. The feedback they’ve gotten on the first version is testament enough, over 2,000 professionals from 81 different countries worldwide have taken the first version of the training course. Total price of the Penetration Testing Professional Training v2 + eCPPT Certification Exam + 30 days access or 30 hours usage time of Hera Lab is $699. As far as I know it’s well updated and a very good introduction to pen testing. I’ll check with the guys from eLearnSecurity though and get them to verify. It’s from 2011 so it is pretty much up to date although not as much as Professional that was launched few days ago. You can take a demo module that will show you how it is structured and a sample of its contents. Let me know if you need more clarifications. If that fails, I’m going to buy it. I want to extend my reach and my testing capabilities. Right now I’m a Software Engineer in Test. But I want to be a Pen tester too. :) This will help me get started a LOT!